So, the new Nintendo Switch is coming out soon and I'm all set for getting one launch day. Fortunately, with my work schedule, I'll get off in time to take a nap and run out to get it as the store opens. I'm super excited for this. Nintendo is my favorite game company and the hybrid of a console and portable is exactly the kind of thing I've wanted forever now. There are two packages available at launch. 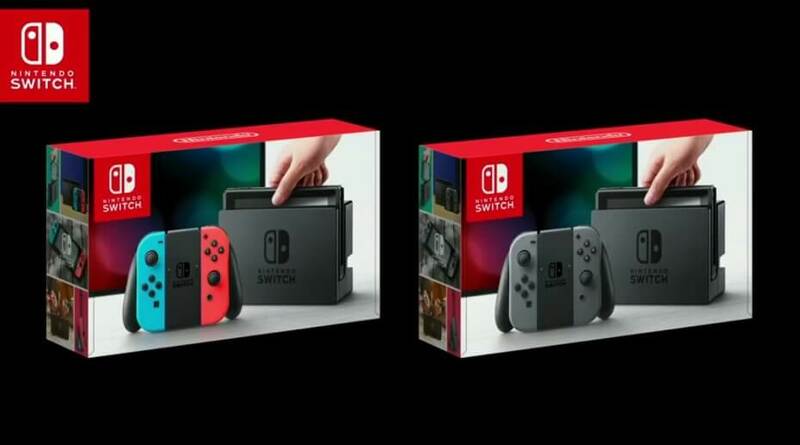 One where the included Joy Cons are grey and match the console. The other, the Joy Cons are two different colors to avoid confusion. In fact, Joy Cons in different colors are going to be a thing and available individually at stores. While I much prefer the standard grey package, as it looks a lot better and more sleek, I can 100% see why the colored Joy Con set would be a good thing to have. Not only to simplify things when using the Joy Con outside of the gaming grip, but also for when it's time to slide them onto the console. It's probably super easy to accidentally try and put the wrong Joy Con on the wrong side. Much like no matter how many times you've inserted a USB cable, you'll get it wrong the first time. I can see myself in the living room on a Saturday night and the wife wanting to move into the bedroom to stretch out on the bed and watch tv instead of on the couch. So, I'd walk over, slide those Joy Cons onto the Switch to change into portable mode, and... crap ... ok got it. With the colored ones, that'd probably not be an issue. Red right, blue left. Easy. Not to mention, the buttons do stand out more on the colored Joy Cons. I can see myself playing in the dark, going only by TV light and wanting to share a screen shot of myself dying again to social media and hitting the home button. Then getting frustrated and not bothering sharing that screenshot that I thought was really funny. I mean, sure taking a pic with my phone of the TV is easy, but usually takes an extra bit of focus and as pictures here can prove, I'm not the best photographer. Also, those colors are super charming. They look neat. But, you know what. That grey is super sharp. It's a very sleek looking device and in grey almost looks a little sophisticated. I'm hardly the GQ type, but I do like my personal devices to look nice. Even if nobody else is seeing them but me, I vastly prefer that bit of coolness that comes from a sharp looking electronic. It's very satisfying to me to have something nice looking. My wireless mouse matches my laptop. Nobody but my wife and myself ever see's my wireless mouse that I use at home. But, I'm very pleased with that little touch of sharpness in form. I know it's silly, but I get to be silly. It's my Switch, it's my money, it's my decision. So here I am, just under a month until I get my Switch, in a personal battle on what color of controller to get. Honestly, the decision will probably be decided on what's available in store. If I ultimately decide I'd like different Joy Cons, I'll just buy the other ones. It's not even an issue. I'm ridiculous. Look, the right case is super important. *edit, a few days after launch day* I got the gray one. Fortunately it's all Toys R Us had on launch day, so I didn't have to ponder, make a rash decision, and later ask myself if I made the wrong decision later. I don't regret it, it looks spectacular. I also got the right case. I may have spent several hours researching it, but I got the right one. BTW, I love this system. Just a bunch of wonderful awesomeness made into reality by Nintendo.